I picked up a bottle of Bowmore Devil’s Cask III on the recommendation of friend and fellow whisky enthusiast Kurt Maitland, who regularly contributes to Whiskeyreviewer.com as Deputy Editor. In fact, you can read his review of this whisky here. 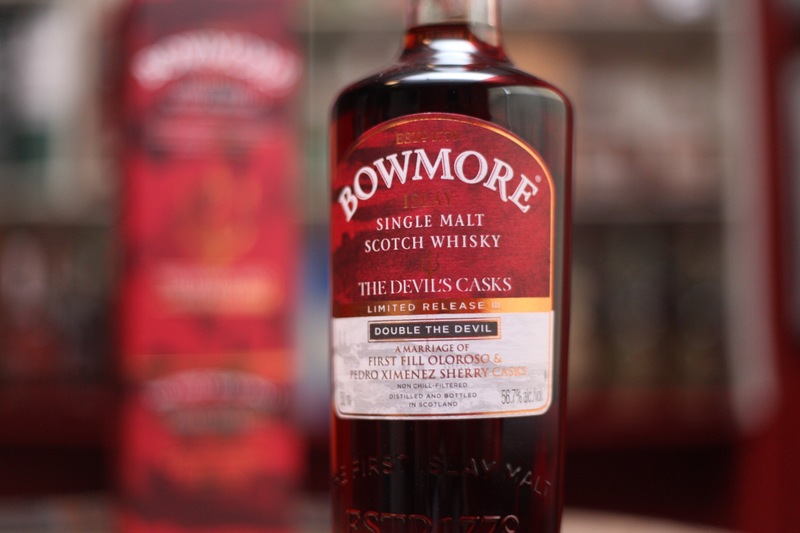 Bowmore Devil’s Cask III is the third release in the Devil’s Cask series. The first two were aged ten years in first fill sherry casks. This third edition carries no age statement. However, it does mention the whiskies inside the bottle were aged in first fill Oloroso and Pedro Ximenez sherry casks, hence the “double the devil” moniker. I’d love to think the maturation in sherry casks is the sole reason for this deep ruby color, but the label doesn’t state whether this is natural color or not. The good news is there is no chill filtering and we have cask-strength bottling. 56.7% abv to be exact. The pricing situation is strange. In the U.S., Bowmore Devil’s Cask III is available for about $85-$90. Across the pond the price jumps up considerably. A peated Islay whisky matured solely in sherry casks? Yes please. The nose is an intricate dance of sherried fruit and peated malt. Brine, blood orange and a touch of vanilla add to the complexity. There’s lots going on here, but it doesn’t feel busy. Bowmore’s signature peat coats your tongue after an initial sting of alcohol. Both stewed red fruits and rich dried fruits emerge from behind a light layer of ashy smoke and vanilla. Towards the back palate, freshly squeezed orange juice provides a touch of brightness. The smoke slightly intensifies in the long finish, along with remnants of mulled red wine. What an outstanding whisky! It’s rich, but maintains a level of vibrancy. The peat smoke and sherry cask influence never overpower one another and maintain a beautiful balance. Thanks to Bowmore for bottling this one at cask strength and not watering it down. Fantastic stuff.